Leave caption below and I’ll send the funniest caption author a copy of my book, Humor Us: America’s Funniest Humorists on the Power of Laughter. Enter your caption below in the comments field. The winner get’s a copy of a book. (No, it’s not as good as a Toyota, but it’s way easier to send.) good luck peeps! https://www.bradmontgomery.com/wp-content/uploads/2018/11/logo-1-495x198-1-300x120.png 0 0 admin https://www.bradmontgomery.com/wp-content/uploads/2018/11/logo-1-495x198-1-300x120.png admin2010-01-29 22:39:102010-01-29 22:39:10Contest — Caption for the Monk! A How-To video series about how to be a motivational speaker. 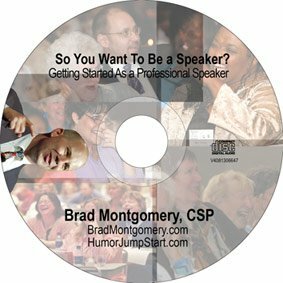 In this very informal video in which Brad Montgomery — a funny motivational speaker — Brad explains the simple format (or template) for creating a motivational keynote speech. Interested in exactly how you can create your own speech? No sweat…here are the details. Template for keynote motivational speech. 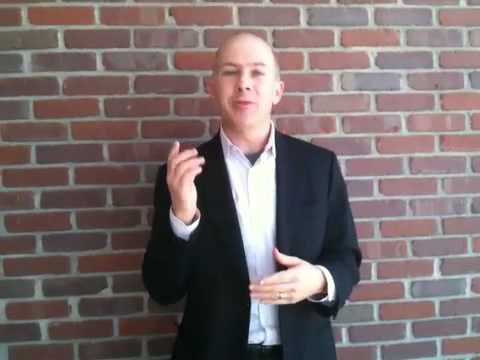 This is Brad Montgomery from Brad Montgomery.com with a continuing series in how to be a motivational speaker and how to be a paid professional speaker. All right so one of the things we never talked about is exactly what is a motivational speech? I know, you got some ideas about what you’re going to do and what you’re going to talk about and I know you have some ideas about your message for when you become a motivational speaker but you’re still struggling with how does it work, what’s the form, what’s the format, how do you put together a motivational speech. Well good news – I’m about to tell you. All right so it’s really not as hard as you think because there’s a formula. Now you’ll notice that almost every good motivational speaker follows the formula and deviates from it but at least let me give you the formula because you’ll be shocked how easy it is. 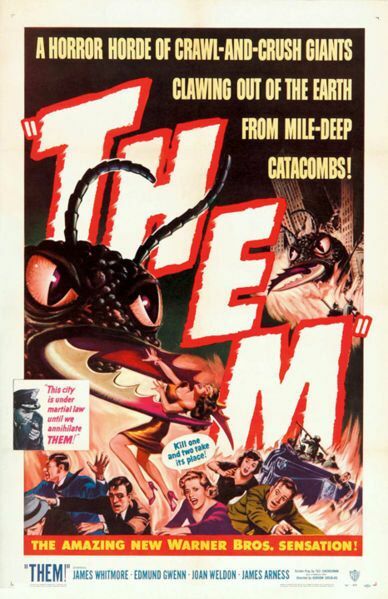 First, you’ve got to have an opening so the opening’s going to be: My name is. Here’s what we’re going to talk about. Here’s my background is and here’s what you are going to get out today’s program. So you’re just going to tell them what to expect. So I’m a funny motivational speaker and I talk to businesses about lightening up so I start, as you might guess, with some jokes and I tell them today we’re going to talk about lightening it up and how that’s going to be related to your business. Get it? That’s the intro – that’s it. That’s all the intro is. Now the intro can be very short or you know like even a minute or two or it can be as long as you know five or ten sometimes fifteen minutes. Because I’m funny I use a lot of humor but I think if you’re a high content motivational speaker you’re going to cut right to it. So for example you might say, I’ve had an incredible car accident and I learned a lot from it and in today’s program we’re going to go through my story and how the lessons I learned relate to you. All right so there’s the introduction. Then you’re basically going to have three points – three points and each point is going to be supported by at least one story. So let’s say for example your motivational speech is to be in you know you want to inspire people somehow. All right so then I’m assuming that you have three techniques to inspire people. So let’s say your techniques are to you know have good relationships and lead others in inspiration and to always nurture yourself – take care of yourself. All right so those are the three points. Write them down; bam, bam, bam. So the first one is, my first point of the day is blah, blah, blah, blah. Get it? You tell them what your point is but they don’t care what your point is unless you have a story. So if your first point is nurturing relationships that’s where you’re going to want to launch into one of your stories about how you nurture relationships or how you learned from this or how something happened to you that is relevant to them. The main part of the story is to hold their interest, to teach the lesson and then really to let them learn from it. How can we learn from your experience without having to go through the pain and trouble that you’ve done. So for example let’s say you’ve climbed Mt. Everest and you want to talk about you know all the fabulous thing you learned about Mt. Everest. What I really want out of that as an audience member is how can I learn all the things you know without having to climb Mt. Everest. So you’re telling us the story of Mt. Everest and then you’re giving us the first point. Got it? So, now we’ve got the introduction, first point and the story to support that point. Then you lead right into the second point and the transition can be as simple as that brings us to our second point. The second point is you need to nurture relationships – I can’t remember what the three points are – but you know the second point is you’ve got to eat a lot of pineapple. You see it doesn’t really matter what the point is and then you’ve got to support that. So, how are you going to support that? With another story so that’s when you need to launch in to another personal story, something that really happened to you and then relate what you learned out of that story and how we can apply those lessons to our lives. Do you get the running theme? Because if you’re a motivational speaker it really isn’t about you and how fabulous you are and how fabulous your stories are or how funny you are; what really is important is how you can get some information and inspiration into us as the audience. All right and then the third point repeat as needed. That leads us to our third point or our third point is to be a leader of inspiration and you know being a leader of inspiration is important because blah, blah, blah, blah and here comes the story to support that point. Got it? So now you’ve just told the introduction, you’ve had three points each one supported by at least one story – by the way if you know you want to do two short stories, go for it; three really short stories, go for it; whatever it doesn’t matter – and then finally is the conclusion and the conclusion really needs to be a summary of what you’ve just done but then most importantly you really need to make sure the audience understands that it’s about them. So even though all the stories are about you and your own life experience the message is about them. So in the conclusion you need to really make sure that they walk out of there knowing that I want to be like that speaker I just heard or at least I want to apply the lessons that that speaker taught because it makes sense to me because after hearing those stories and hearing all the reasons behind it and hearing the original thought there’s no way in the world I can’t you know, I can’t leave as a better person after hearing that speaker. Got it? So the main format is introduction, point supported by a story, second point supported by a story, third point supported by a story, and then a conclusion which all along you’re going to be talking about your audience but especially at the conclusion you’re going to make sure that the speech is not about you it’s about them. All right so becoming a motivational speaker is a blast of it’s fun and it’s not as hard as you think. My name’s Brad Montgomery from Brad Montgomery.com; really happy to be part of it. If you like this video click over here or okay – I’m not really sure where the links are but there’s a couple of links. I’ve got a couple programs out about how to be a motivational speaker and another program about how to be a funny speaker and trust me being a motivational speaker is cool but being a funny motivational speaker means you get hired. So adding humor is really crucial no matter what your topic is. Thanks for your time. Look for more videos from me soon. Glad to be aboard. Cheers. Interested in learning how to use humor in your presentation? 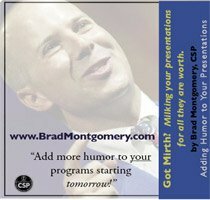 Check out Brad’s <a href=”http://www.humorjumpstart.com/got-mirth-info.html”>Got Mirth: Milking Your Presentation for all the Humor It’s Worth</a>. <a href=”https://www.bradmontgomery.com/2010/01/12/be-a-motivational-speaker/”>How To Be Speaker (3)</a> Format of a Keynote. A Template! Are you eager for a better workplace vibe, (oooh! what a fancy business buzzword!) more freedom to have fun, and an escape from a lousy toxic work environment? Are you waiting for “THEM” to enable you to to make that happen? Can’t wait until they finally fix it so that you can start working as hard as you should be? Can’t wait for them to change that one thing so that work can be fun — and productive — again? Well then, lucky you, because this video is just for you. For you non-video folks, here’s the text of the video in my post here. Hey, this is Brad Montgomery from BradMontgomery.com with the message of the day. Here it comes. You are they. Let me explain. All right, I can’t tell you how many times I’ve gone into organizations and I hear from the top line leaders, to all the support staff, everybody says we can’t do that until they make it possible. So, it’s either we can’t be more productive, we can’t have more fun, we can’t fix this toxic work culture. I can’t have any fun in life until they fix it. Well, this is a problem, isn’t it? I swear, I’ve met people that are so upset; they’re willing to be miserable. They’re willing to say, I’m going to be miserable until retirement, because they’re not going to allow me to do what I want to do. Well, can you hear how ridiculous that is, how stupid you sound? Listen, if you want to make a difference, here’s what you need to remember. 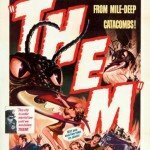 You are the they. So, yes, yes, there are sometimes at work and in life, there are some impediments to letting us get as much joy, and as much fun as we deserve. Yes, I understand that. Sometimes your manager stinks, sometimes your boss stinks, sometimes your staff stinks, sometimes whatever, it’s there. On the other hand, what are you going to do about it? Are you going to sit around and say, well, it stinks; it’s not going to get fixed until they fix it. Or, are you going to be the person who says, lets lead the way. Are you going to be the leader? Somebody in every single positive work culture is the leader in levity, lightheartedness, joy and even humor. Somebody’s always that person who has more energy than everyone else. Why shouldn’t that be you? Why not? Are you really going to wait and be miserable until retirement, or are you going to start being the guy who says, I’m going to lead the way. So, if you want to have a little bit more fun at work, and you should, if you want to have a little bit more fun with your family, and you should, well then it’s going to start with you; you are the they. Now the cool thing about this is we know this. We know that in this toxic environment, if there ever was a time that we deserved to lighten up and enjoy ourselves, it’s now. get to outstanding. All right, how’s it going to happen? It’s going to happen with not they, it’s going to happen with you. My name is Brad Montgomery. If you want some specifics about how to do it, there’s, shoot, click the buttons, see the buttons. I don’t know where the buttons are, but there’s buttons all over the site. Give us a call. We’d love to help you and your organization. Make it a great day, and I mean you make it a great day because it’s going to help you get what you want at home and at work. What do YOU want to learn? Questions? Topics you want to make sure we cover? Leave a comment below and we’ll make sure to answer your questions at the program. https://www.bradmontgomery.com/wp-content/uploads/2018/11/logo-1-495x198-1-300x120.png 0 0 admin https://www.bradmontgomery.com/wp-content/uploads/2018/11/logo-1-495x198-1-300x120.png admin2010-01-15 10:19:162010-01-15 10:19:16NAFDMA - See You in Lancaster! 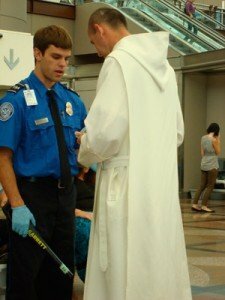 Get off Your CASE and Do Something! I’m just back from the Council for Advancement and Support of Education (Region VI) in St. Louis, Missouri. We had a great time talking about how those people in the Advancement Professionals — a job title that still cracks me up — can incorporate humor, levity and lightheartedness in work in order to achieve more at work. Here’s my short summary and reminder video. Hey CASE VI! Leave a comment in the space below and I’ll send ya an Ethical Bribe. Yup, I’ll send you something. Nope, not a$100 bill or a Toyota Corolla, but it’s fun and you’ll like it. Promise! Hey CASE VI, it’s Brad Montgomery from Brad Montgomery.com. Thank you so much. 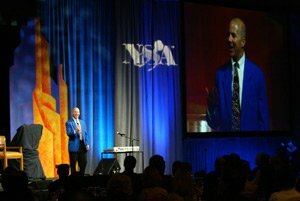 It was so cool being the keynote speaker in St. Louis. I promised you a quick follow up and I wanted to remind you of the three tools, the three ideas that we talked about that are going to remind you to bring levity and lightheartedness and humor and even joy back to work. First, find happy starting right now. Find things that remind you that life is good and my game was how cool is that. You’re getting a follow up video from a speaker you saw just recently – how cool is that. All right, the second thing is choice, right. Pick happy; it’s a choice. If you want to have a good day at work today and tomorrow; if you want your teams to have a good day at work; if you want work to be fun for you then part of it is making that conscious choice. Remember we talked about this when we were in St. Louis. Well, I’m telling you if it’s important to you are you willing to make that choice. Can you lead the way. And then finally, the third one was act happy. What are you physically going to do today to create joy and humor for yourself, for your family, for your team, for your organization and I’m suggesting you’re going to have to do something so maybe that means something crazy like wear a clown nose at work or maybe it just means listen to funny stuff, read positive stuff, linger over the funny pages or tell a knock-knock joke to your cat. Brad Montgomery, Brad Montgomery.com. If you leave a comment below on this blog I promise I’ll send you something fun but let me know what you’re going to do differently based on our time together. Thanks CASE VI, it was a blast.